Katie’s Diner. 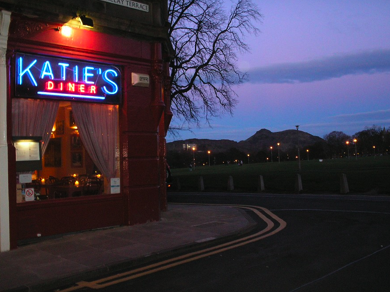 I’m always amazed at the number of people who live in Bruntsfield and haven’t heard of Katie’s Diner. It’s a bit tucked away on Barclay Terrace, but the bright blue and red neon sign in the window means you can’t miss it if you’re walking across the Links. It’s an American Style diner, serving brilliant burgers and steaks in a relaxed setting. The walls are covered with posters and photos of iconic American landmarks, and the shelves are cluttered with various knick-knacks that Kate and Geoff’s loyal customers have brought them back from holidays in the US. If you’re in for a meal, look out for a model of King Kong climbing the Empire State Building – that tasteful piece was a contribution from DorkyDad and me. Make Poverty History. 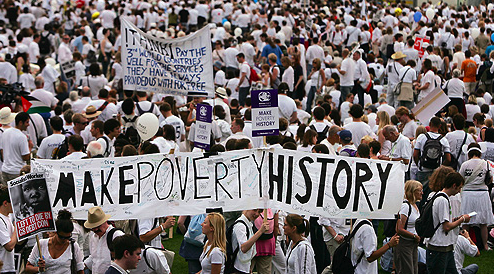 Say what you like about the success or otherwise of the Make Poverty History campaign and all that has followed… but being in Edinburgh for the MPH march on that incredibly sunny day in 2005, it really felt like we were part of a moment. I was stewarding the march for the first part of the day, so arrived at the Meadows very early in the morning for a briefing, not knowing if the attendance was going to be 1000 people or 10,000. I remember standing there as crowds started to gather… and they grew, and grew, and grew. In the end a quarter of a million people descended on the city to make their ‘white band’ around Edinburgh Castle. It felt good to be one of them. Margiotta. Definitely a contender for the best local shop ever, Margiotta takes the humble corner shop and elevates it to a whole new level, with lovely fresh-baked bread, home-made pizzas and a tooth-chattering collection of traybakes. There are several Margiottas across Edinburgh, but the one on Marchmont Road was our regular. I don’t know how they make any money, because they always try to talk you out of half your purchases. ‘Organic milk? Pfft! Are you sure you don’t want the non-organic, it’s much cheaper! A lottery ticket?! Pah! What are you wasting your money on that nonsense for? !’ Once you crack through that cynicism though, you soon discover that the owners are as lovely as the shop itself. Meadows. Revising in the sun, drinking beer and having barbecues with friends, browsing stalls at the Meadows Festival with DorkyDad… I’ve seen a gorilla playing drums here, and heard a brass band doing their version of Gangsta’s Paradise. It is where DorkySon learnt to walk, and then to run. 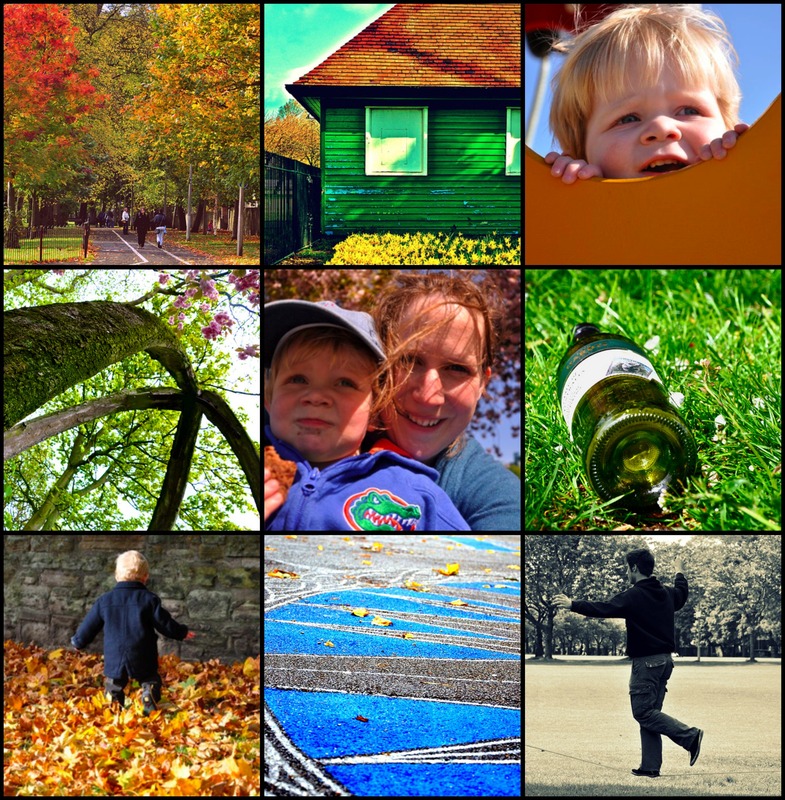 The Meadows is the joyful, beating heart of Edinburgh, and I have too many memories of it to list… so a photo collage of some of the best will have to do. National Museum of Scotland. When the NMS re-opened last summer after a £47 million re-fit, I couldn’t wait to go along and see the changes that had been made. The joint DorkyMum-DorkySon verdict is that it‘s… mmm, well… it’s okay. I miss the fish. DorkySon hates the dinosaur that you have to walk past to get into the animal exhibits (really hates it – he buried his head in my shoulder and cried while I picked him up and we sprinted past it – much to the bemusement of poor Scribbling Mum and Miss P who we were meeting for the first time). We are much bigger fans of the bit next door – the old Museum of Scotland – with its steam train and funny holes in the wall for sticking your head through. I don’t know what that says about us… Nothing good. I was there too in 2005. We were the ones taking a three year old to the first aid tent because he’d whacked his head at the playpark in the Meadows! I’m loving your vision of Edinburgh where I haven’t lived since 1993! My sister is there though so we do return quite often. I hope your new home serves you as well. I totally need to catch up on these. Margiottas – classic – I think I’ve worked in every branch and they use to pay you according to age so when I was 14 I got £1.40, 15 £1.50 and so on! Cheeky shites. And the Meadows – yes, the place of my very first night drunk – 16, on Southern Comfort, we all lay out and watched the stars (before going home and tasting the Southern Comfort again, only not so nice on the way back up, I’ve never drunk it since). Nooo, really? That’s shocking! I’ll have to get the inside chat from you on the managers sometime! Really? That’s a good bit of random indie trivia to store away for future use! Thank you so much for including us as one of your memorable eating places in Edinburgh.